Town record or lienzo painted on a plain-weave cotton cloth which consists of nine four-selvaged cotton panels joined together to make one large sheet. 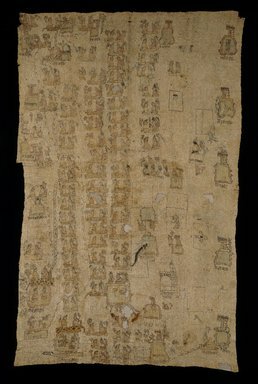 This form of Spanish Colonial manuscript was made to provide visual information regarding the history of indigenous Mixtec communities in the Valley of Coixtlahuaca, in the modern state of Oaxaca, Mexico, and their relationships to each other. It is one of six major lienzos that were made for the towns in this Mixtec valley. All share the features of having many place glyphs; delineations of land represented by rectangular areas and often identified by glyphs; written glosses in several languages, including Nahuatl (most frequent), Choco, Mixe and Spanish; and royal genealogies that may encompass other communities as well. The Lienzo of Ihuitlan has all of these attributes, including twenty-one place glyphs, usually glossed in Nahuatl. In general, the glyphs are arranged around the circumference of the textile, and the glyph for Ihuitlan is farthest from the edge in the lower right corner. That glyph is distinguished by a drawing of the Dominican church of Santiago Ihuitlan which is adjacent. The glyphs parallel the locations of the communities in the valley which identifies the lienzo a map, with the uppermost section oriented to the north. Besides the church, the only other European element is the twenty-one names marked in Spanish script. In the center section, genealogies of community rulers and their place glyphs appear, however, not all the place glyphs have corresponding genealogies. The most extensive genealogies are those for Coixtlahuaca, Ihuitlan, and the two unglossed and unidentified localities that have been thought to represent Water and Texcalhueyac. The husband and wife of each generation are seated on a mat or jaguar skin, ancient signs of rank, with a name symbol painted beside each figure. There are 170 figures, arranged in columns according to dynasties and in some cases connected by rows of footprints to indicate how certain rulers were descended from those of other towns. Although one dynasty does not have place identification, through comparison to another lienzo, it is thought to be the Yucucuy dynasty. Three couples make up the rest of the dynastic list with the first relating to the sixth ruling pair of Yucucuy (as seen on the Lienzo Antonio de Leon). Footsteps descending from this couple are evidence that they are the parents of Female 8 Death of the founding pair of the first dynasty of Ihuitlan. The genealogical parts of the lienzo are divided into two sections with the bottom area containing a gloss but not a glyph and three pairs of ancestors; the center area contains the opposite iconography showing a glyph and not a gloss and fifteen pairs of ancestors. Although there are no footprints connecting the genealogies, in the Lienzo Antonio de Leon, the last couple of the first dynasty, Male 4 Water and Female 3 Grass, are represented as the parents of Male 6 Rain, the first ruler of the second dynasty. Genealogies in Mixtec lienzos are thought to validate the legitimacy of the rulers of the communities; however, in this lienzo they also illustrate the ruler's ownership of the community lands as a whole. This inclusion probably helped insure the preservation of the lienzo.